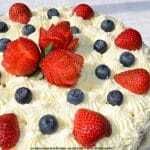 This fun red, white and blue cake is decorated with fresh berries and whipped cream, and filled with rich custard. It’s great for the Fourth of July or Memorial Day gatherings, and uses no artificial colors. Preheat oven to 350 F. Grease and flour two 9 inch round pans. In a large bowl, cream together butter and sugar. Add egg and vanilla and stir until blended. Set aside. In medium bowl, sift together flour, salt and baking powder. Alternately add dry ingredients and milk to butter and egg mixture, stirring after each addition, until all ingredients are added. You can do this in an electric mixer, too, I just like mixing some things by hand. Pour batter into prepared pans. Bake 40 to 45 minutes, until lightly golden brown on top, pulling slightly away from the edges of the pan and testing done with a toothpick. Invert onto wire rack to cool. Mix sugar, cornstarch and salt in a small saucepan. Gradually stir in milk. Bring to boil over medium heat, stirring constantly. Boil 1 minute. Remove from heat. Temper the egg yolk by stirring at least half of the hot mixture into the egg yolk. Blend the egg yolk mix into the remaining mixture. Boil 1 minute more. Remove from heat. Blend in butter and vanilla. Cool, stirring occasionally. Whip the cream with the confectioner’s sugar and vanilla, until slightly thick. Makes about 4 cups of whipped cream. Brush off any loose crumbs from the cake. Place bottom layer on serving platter. Spread chilled custard on bottom layer, leaving about 1 inch clear around the edge of the cake. Pipe stabilized whipped cream around the edge of the cake layer to contain the custard. Note: If you don’t have a pastry bag, you can use a plastic storage bag with a corner cut off for a substitute, but a pastry bag is easier. Also, to fill your pastry bag, it’s helpful to set it in a large glass or jar to hold it upright while you fill. Place top layer on cake. Pipe whipped on to cover the top of cake and around bottom edge. If you have any whipped cream left, you can pipe extra around the center between the two layers. Arrange berries on top in a for decoration. I sliced some strawberries in half, and cut some into roses for the center of the cake. I substituted Namaste Gluten Free Flour Blend with good results. That’s what’s pictured in these photos.